From Oct. 17-21, five Illinois golfers had the thrill of competing in a high profile national golf tournament. They joined 171 other Special Olympics golfers from the United States and Canada at the 2013 Special Olympics North America Golf Invitational Tournament, presented by KPMG, at the Stockton Seaview Hotel & Golf Club in Galloway, N.J.
“Team Illinois” bonded on the first day at the opening ceremony when teams paraded in holding their state name, followed by a fireworks display over Galloway Bay, according to coach Dieter Jaehn of River Valley Special Recreation Association (Area 8). 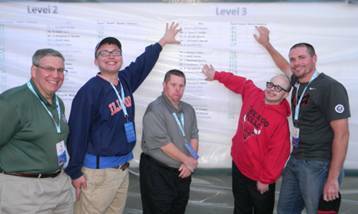 Illinois had two Level 3, 18-hole Unified teams: athlete Ben Brizzolara and Unified Partner Mike Chmielewski from Fox Valley Special Recreation (Area 2) and athlete Eric Schmidt and Unified Partner Dave Dauphin of Northern Illinois Special Recreation Association (Area 13). Steven Weith of River Valley SRA competed in the Level 1 Skills competition. Unified Golf pairs a Special Olympics athlete with a Partner without a disability, competing against other Unified teams. The Brizzolara-Chmielewski team finished with a 3-day total score of 413 and received a participation ribbon in Division M6. The Schmidt-Dauphin team competed in Division M1 and finished with a total score of 257 after 3 daily scores of 87-80-90 – good enough for the gold medal. View photos of the Illinois delegation at the National Golf Invitational. All six members of the delegation savored the whole experience. “Throughout the weekend, the examples of camaraderie among the athletes and the caring and generosity of the KPMG volunteers and others was overwhelming and created more of a family environment than one of competition,” said Jaehn. For Steven, his life-changing experience went beyond golf; it was his first time on an airplane and the first time so far from home without his family. “I’m just trying to do my best – I’m doing this for my father,” he said. His dad had passed away a number of years ago and was Steven’s inspiration. Mr. Weith would have been proud of his son who took a silver medal in his division. Coach Jaehn did a great job of documenting his and Steven’s experiences at the tournament and voicing a “play-by-play” of how Steven approached each of his golf skills competitions. See his 2-part account: http://www.youtube.com/watch?v=IRGaHzLMdss&feature=youtu.be and http://www.youtube.com/watch?v=kyeYS56NrZk. The golf invitational was hosted by the 2014 Special Olympics USA Games Organizing Committee in conjunction with Special Olympics North America with support by The PGA of America, USGA and PGA Tour. Next year, approximately 200 golfers from throughout the U.S., including four from Illinois, will compete June 14-21 at the 2014 Special Olympics USA Games being held in the Princeton and Greater Mercer County area of New Jersey.